As sad as I was to leave Croatia and Zagreb behind, I was also rather excited for the next and final stage of my trip – Budapest. Located in Hungary only a mere six hour train ride from Zagreb, with a well utilised international airport (aka cheap flights), Budapest seemed liked a really logical place for the conclusion of my two month trip. Everything I heard from other travellers on the road only served to confirm my expectations that I would have an awesome time. And I was right. Budapest ended up being one of my favourite stops in the second month of my trip. My arrival was a little bumpy initially. I arrived into one of the main train stations and found it terribly confusing. Eventually I found the metro which I swear wasn’t very clearly signposted. Then I tried to check into the wrong hostel. Sigh. I was staying in a hostel called Carpe Noctem Vitae. Which is a great hostel. But the one I tried to check into had a very similar name of Carpe Noctem. Easy mistake. Four other people had done the same thing that day apparently. And annoying since the incorrect hostel was located on the top floor of its’ building with no elevator. It was very disheartening to huff and puff my way up six flights of stairs to the top, then be told I was at the wrong place. At least they let me recover on the couch for a bit before I started the seemingly long walk to the correct hostel. Well it was only a ten minute walk away but my bag was feeling particularly heavy that day so it felt more like two hours. That first night was pretty tame. I was feeling exhausted and grumpy after unnecessarily dragging my bag around making my shoulders ache. For my dinner that night I didn’t even try some Hungarian food. I chose a guaranteed delicious option of pad thai to cheer myself up. Nothing like your favourite thai dish to make yourself feel better. An early bedtime also works wonders. I felt like a different person in the morning. Budapest version of love-locks. Not as impressive as Paris I think personally. Although my walking tour guide claimed this was the original one.. The Szechenyi Spa house by daytime.. I also found a cafe filled with cats and coffee just behind the Basilica..
A rather ordinary if a little run down looking building on the outside.. The walls are covered in graffiti and holes, the furniture is all recycled junk. But that’s part of the charm of Budapest’s ruin pubs. Out of everything I saw in Budapest, I would consider this particular pub to be unmissable. Alright shall we get to the juicy part? I know you’ve all been dying to know how I missed my flight. Cheeky readers you are. Well it all started with that caving tour.. which was arranged through my hostel. It was quite popular to do so was booked out completely until my last day in Budapest. My flight wasn’t until 3.30pm that afternoon and the caving tour itself started at 9.30am. Piece of cake I thought. Admittedly I did forget to ask what time the tour would finish. The caving tour was awesome. It was a lot of fun crawling and sliding through caves. That outfit and the helmet turned out to be very necessary. I was covered in multiple bruises with achy muscles for the next week. But the location of the cave entrance was actually quite far from my hostel. Had I realised, I would have brought my luggage with me on the tour. By the time the tour finished, it was 1pm. By the time I made it back to the hostel it was more like 2 pm. Considering it takes up to an hour to get out to the Budapest airport, I was cutting it pretty darn fine. I still had some horrible hope that I could make it. I jumped into a taxi with a driver who spoke no english and entered immediately into a traffic jam. Eventually we made it to the airport with me digging my nails into my palms sitting on the edge of the seat. I don’t even know how much my fare was as I shoved my card at the driver and ran off asap. I felt pretty sure that I had missed the baggage deadline but gosh darn it I was going to to try! Panting and sweating I dashed up to the Norwegian Air check-in desk which thankfully had no queue. Bless those kind attendants. Even though the baggage check-in had closed technically one minute ago, they still allowed to drop my bag to my surprise and completed a quick check-in for me. But they cautioned that I needed to rush through the airport as the gate was closing very soon. After that was when I did my big mistake that made me miss my flight. I rushed through security throwing all my things and boots into one of those container tray things to go through the scanner. As I shoved my boots on afterwards looking at my watch and preparing for the next jog, I ran off not noticing my passport was still in the container tray. I got to passport control and started hunting through my small backpack for my passport. I still couldn’t find it even after I dumped everything out on the floor. I was beyond caring what anyone thought at that point. Thinking furiously as I knew I had my passport when I checked in, I came to the sick conclusion that I must have left it in security. Must have as there was nowhere else I could have left it other than the check-in desk itself. I backtracked and explained my situation to the security personnel. Of course by the time my passport was found 10 minutes later, it was too late. My gate had closed. Against all the odds I had made it to the airport only just in time for my flight, but then missed it due to a dumb blonde mistake. Ugh. I also hadn’t had any lunch by that point and was starving. I’m going to blame my blonde mistake on that as come on, who leaves their passport behind in security? After such an active morning with a stressful afternoon, my blood sugar was definitely on the low side. As I’d realised in the taxi on the way to the airport, when I felt convinced that I had already indeed missed my flight and that there were no snacks in in my backpack, it wasn’t the end of the world missing that flight. All I had to do was buy another flight ticket. Expensive yes. But not the end of the world. I still managed to get my checked luggage back from that flight which I thought was a little strange. The airline had time to fish my bag out of the hold but no time to let me on? At least the kind airport attendant at the closed gate showed me to where I could buy another ticket. Easyjet had another flight to Gatwick in a couple of hours so once I brought a new ticket (which was much cheaper than I expected at £180, this was the bonus of being at a big international airport), I checked in again and breezed through security with one intent on my mind – to treat myself to a darn good lunch and cocktail. And a big chocolate dessert. Sitting there relaxing with my cocktail in hand, I did suddenly notice that it was boarding time for my second flight. That two hours had disappeared. There was no way I wanted to miss this flight. I got my cocktail transferred to a to-go cup and was off at a fast walking pace to my gate. By the time I was sitting on the plane, I was relieved to be at the end of my long two month trip. That last bit of stress was just enough to finish me off. I felt ready to work again in my regular job as a nurse. Boring yes but an exciting thought to be alone in a bedroom again with decent sleep quality again. And with money coming in rather than only out. Next post will cover a wrap-up of month 2. Stay tuned! Overall: Great hostel! 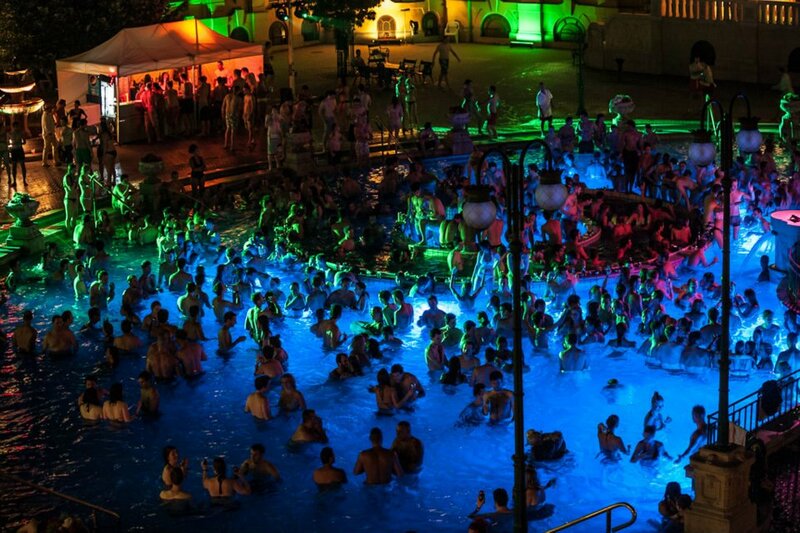 It is a party hostel and part of a chain of party hostels in Budapest. But it is considered the the tamest one which is what I liked about it. Every night the hostel had planned parties in collaboration with the other party hostels (Like the pool party Sparty), but they would be located somewhere else which meant the hostel would be quiet at night-time so you could actually sleep if you wanted to. I liked that they enabled extreme drunkedness by having the hostel key as a wristband with the hostel address so that way you were unlikely to not find your way back at night. The beds were comfy and the staff very fun. I loved the price too which was very reasonable compared to other Europe cities. I had a good time staying here.